Sarees are still the most favored fashion for women of all ages in India. Since it’s a six yard length of exotically embroidered length of fabric–in silk with gold/silver threading or beadwork, or plain or decorative cotton or synthetic. Perfect for every figure, and you never have to worry about gaining or dropping a few pounds. 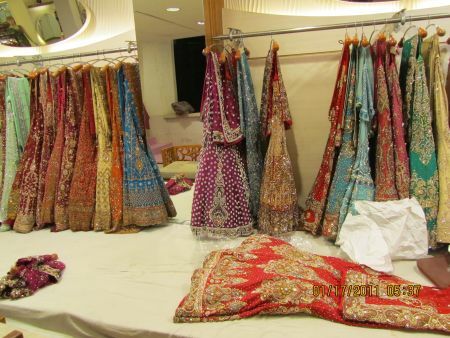 Here are few examples of different styles, beginning with the fancy saree shop next to our hotel in New Delhi. We were greeted by these mannequins. There were several people in the shop, but the customer who caught our eye was this beautiful young girl shopping for her upcoming March wedding attire. I missed some fantastic shots of mirror images by taking too long to get the gumption to ask if I could take her picture. After the previous night’s camera fiasco, I was a little camera shy. As you can see, she didn’t seem to mind at all. Her only concern was that the people with her seemed to be pushing her toward this dress and she wasn’t sure about the color. Indian weddings can be a several day occasion, however, and it may have been that the green outfit was for one of the other ceremonies rather than the actual ceremony. Clearly the color choices and styles were unlimited, and the more traditional wedding dress color, red, seems to be waiting. If I’d been 40 years younger and six sizes smaller, I would have tried on a few myself. I did notice that a lot of younger women working in large cities are wearing more western-style slacks and jackets, or the more traditional kurta or salwar kameez these days. Besides the saree, that’s what you’re most likely to see women in India wearing these days. The biggest difference between the two–as far as I can see–is the salwar kameez is usually worn with a matching churidar pajama or tightly fitted trousers and are worn by both men and women. I used to wear sarees for dress up occasions, but I favor the kurta which is more like a collarless shirt available at lengths that fall slightly below waist, or hip or mid-thigh. I wear mine with slacks or jeans, and sometimes they actually make me look slimmer. I reached way in the bottom of my photo box to fish out some old pictures of wedding fashions from weddings I’ve attended over the years and came up with a few I thought you might enjoy seeing. This is Hubby’s niece, Malavika, in the saree she wore on her wedding day. Notice how the “palav,” the end piece that drapes to the back, is wrapped over her left shoulder and back around at the waist and tucked into her waist on the left side. The pleats open toward the left also. It may surprise you to know that there are many different ways of wrapping a saree than the one most commonly seen. Here’s his sister, Saradi, in a slightly different wrapping style usually favored by Gujarati women. Rather than draping over the left, the palav is draped over her right shoulder and ends about thigh length. One of the more subtle ways saree fashions change from time to time is where the palav ends, sometimes longer, etc. Notice the pleats in this style open to the right. Another is where the waist-line falls. The current trend–for Bollywood actresses and the more daring younger woman–follows that of our western-style drop waist jeans and slacks (see the last saree at the bottom in turquoise). Also noteworthy is the use of elaborate gold threading and embroidery on both sarees here. Most likely, these were made in Banares which is noted for its beautiful gold and silver threaded fabrics. Wedding sarees are usually nine, rather than six yards. Just as women in the west feel awkward wearing certain styles of dress as they age, women of a certain age and the Brahmin caste in India often begin wearing nine yard rather than the six yard saree. To do otherwise will seem very forward in some communities. Here’s my mother-in-law, Neelu, in her nine yard saree. Somehow she managed to drape all this fabric over her approximate four-foot eight-inch body. Already widowed by this time, she was actually being very modern by wearing color. Widows normally wear white with no accessories or jewelry. Now, a special treat (not! ), here’s me in a nine-yard saree, although clearly I was much too young for it at 38! How about that afro? How’s that for bucking tradition?! Talk about being forward! On a subsequent visit I was given a nine-yard saree that had belonged to my mother-in-law. This is Deepa, who’s now all grown up and married and living in this country. She’s wearing what little girls like to wear on dress up occasions. This one happens to be a hand-me-down from us as it was worn by our oldest daughter when she was younger. The blouse is custom made by tailors in India and the pleated skirt is silk with gold threaded designs. Now, if your taste runs more to the traditional, and all this chat about sarees has made you want to try one on, or you’ve always just wondered how it’s done, here’s your chance. That is, if you happen to buy lots of fabric in bolts on hand. Just measure off a piece six yards long, and follow these wrapping instructions. You don’t even need to know how to sew. Oh, and by the way, The foundation garments for the Saree is a waist to floor length petticoat tied tightly at the waist by a drawstring (not elastic) and a tight fitting blouse ending at the midriff. 1. Starting at the navel, tuck in the plain end of the sari into the petticoat for one complete turn from right to left. Make sure that the lower end of the sari touches the floor. 2. Beginning from the tucked in end, start making pleats in the Sari, about 5 inches deep. Make about 7-10 pleats and hold them up together so that they fall straight and even. 3. Tuck the pleats into the waist, slightly to the left of the navel, and make sure that they are turned towards the left. 4. Drape the remaining fabric around yourself once more, left to right, and bring it up under the right arm and over the left shoulder so that it falls to about the level of the knees. 5. The end portion thus draped is the pallav, and can be prevented from slipping off by fixing it at the shoulder to the blouse with a small safety pin. There! Now you know how easy it actually is, you might be ready to buy one for your very own. You’d be surprised how comfortable they can be, especially if you follow the tip #5. Fascinating! I’m thoroughly enjoying our blog tour of India. My aim is only to please. Glad you like them. What beautiful women and I love how they dress. I think it would be cumbersome myself but they all look so elegant and … womanly. You’d look beautiful in one Edna! But personally I doubt you’d enjoy doing housework in them. Oh, so lovely. My mother often wore her three after a trip to India. She looked lovely in them, and I always thought the fabrics stunning. You look stunning too. Have you any pictures of your mother in one of her sarees? They do make women look graceful, don’t they, even me to some extent. I saved this post until I had time to soak myself in it! They are fabulous and I have to say my favourite is the last one. Did you know I once managed to try on a sari? It was just for a few minutes but it did feel very elegant. I think you need to do a video version of the instructions! I love all of these colors and fabrics. Tin was again a big successful hit wearing the outfit your daughters brought back from their trip – I’m going to have to go there to get him the next size up!